Yesterday I found out it was a lot harder here in David than I had thought. To be honest, I understand more Spanish words than I speak, so I try to get by as best as I can using Spanish, sign language, and English. But here in David, Panama, simple things can get complicated, especially when you don’t speak or understand Spanish very well. And my poor hearing, even with my hearing aids, can make it hard to even understand English when spoken softly or with an accent. Undaunted, I hopped in my car and off I went in search of a place that could cut some car keys. Let the adventure begin…..
My first stop was Novey, they cut keys but not the car keys I needed. Next stop, the auto parts store, where I was told “…en frente Supermercado”, (in front of the supermarket). I went there, but saw no key place. Since I didn’t feel like asking anyone a question that I probably wouldn’t understand the answer to, it was back on the road for me. Now I REALLY didn’t want to go back and tell Kris that I couldn’t get the keys cut and have ask her to please come and translate for me —- what to do now??? Then It hit me – just go to Canasta Basica a few blocks away and see if the English-speaking manager, Oliver, could help me. Canasta Basica is a government store that sells food at low prices. People drive long distances to buy meat and chicken since the prices are far lower than in their towns. The store was full and very busy, but when my friend Oliver spotted me he immediately stopped waiting on customers, came to over to me, said “Hello”, and shook my hand. There was hope-Oliver to the rescue! When I asked him if he could help me find a place to copy my keys he turned around, went in his office, and came back with a phone number. Two calls later Oliver had the name of a man who would be coming in 10 minutes to help me. I was surprised that anyone would drive 10 minutes just to cut some keys, that sure wouldn’t happen in Florida where I came from. But, sure enough, about 10 minutes later I was in a car going who knows where with a stranger I had just met who spoke no English. This was going to be interesting. I must admit I felt a little uneasy handing my keys over to a perfect stranger, leaving my car at the store and hopping in with him. This was even more of an adventure for me since my new friend, whose name is Arturo, spoke close to NO English. But even as I responded “No entiendo”, (I don’t understand) a few times as he spoke in Spanish to me, Arturo was not going to stop trying to communicate with me. He kept talking for the 10 minutes it took to get to his shop and I’ll be darned if I didn’t start to understand a little what he was saying. He had a great smile, a good sense of humor, and was obviously a guy who liked to help people. And I sure needed the help. When we arrived back at the car Arturo wanted me to try the key in the lock. I did, but it didn’t turn so Arturo took the key and filed it until it worked smoothly. He tried it on both doors, the trunk, the ignition, and squirted lubricant in all the locks. The key now worked great. Success! Thanks to Oliver and Arturo I had my keys and had made a new friend. And once again I was impressed by the display of the Panamanian spirit of being kind, helpful, and giving. I asked Oliver to tell Arturo that I appreciated all his help and that I would write a post on my blog to help spread his name to the FindinMyselfinPanama readers and get Arturo more visibility and business. We thanked each other, shook hands and said goodbye. I had made a new friend! 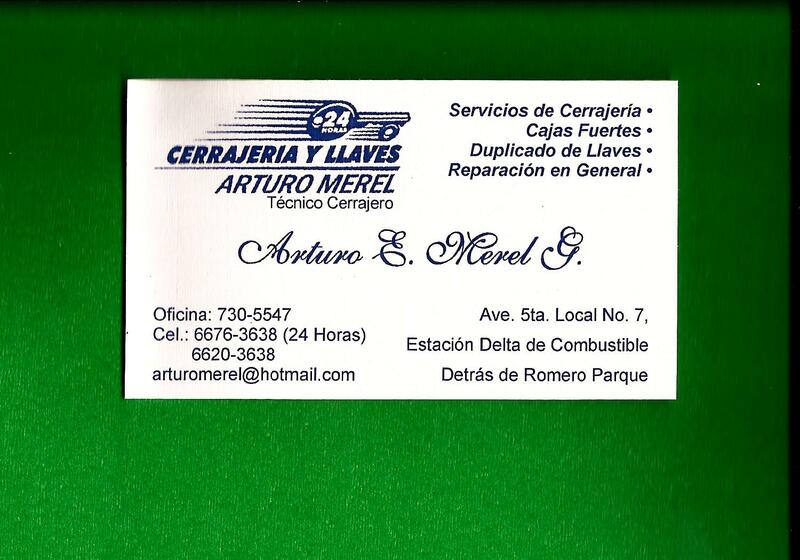 If you are ever in David and need help with keys or otherwise, I highly recommend Arturo Merel. His shop is located near the bus terminal downtown. Arturo specializes in keys but also does other installations, fans, if I understood him correctly. I got the feeling he does a lot of things and that if he can’t help you, Arturo will find someone who CAN help you. And Arturo emphasized the fact that he is available 24 hrs a day!!! Thanks again, Oliver and Arturo!! !